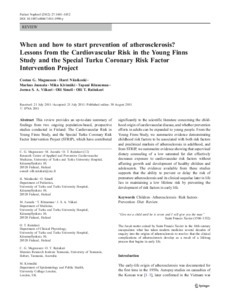 This review provides an up-to-date summary of findings from two ongoing population-based, prospective studies conducted in Finland: The Cardiovascular Risk in Young Finns Study, and the Special Turku Coronary Risk Factor Intervention Project (STRIP), which have contributed significantly to the scientific literature concerning the childhood origin of cardiovascular disease, and whether prevention efforts in adults can be expanded to young people. From the Young Finns Study, we summarize evidence demonstrating childhood risk factors to be associated with both risk factors and preclinical markers of atherosclerosis in adulthood, and from STRIP, we summarize evidence showing that supervised dietary counseling of a low saturated fat diet effectively decreases exposure to cardiovascular risk factors without affecting growth and development of healthy children and adolescents. The evidence available from these studies supports that the ability to prevent or delay the risk of premature atherosclerosis and its clinical sequelae later in life lies in maintaining a low lifetime risk by preventing the development of risk factors in early life.